You will learn different aspects of making contact with people from other cultures: knowledge about making contact and manners/propriety, knowledge about (non) verbal communication and knowledge about power distance. These aspects are important to keep in mind when approaching anybody, but certainly somebody with a different cultural background. To reach the goals, you will read theories, view videos, make assignments and discuss cases with your peers. Social initiative is more directly rated to initiating and sustaining interactions with other groups. As said in the introduction of this chapter, we divided social initiative into three aspects: making contact, (non) verbal communication and power relations. This doesn’t mean that these aspects are totally separated from each other, it’s mingled. But to give clear assignments, we highlighted some features separately. The first step to get in touch with someone is to step up and greet. It sounds simple, but there are a lot of different norms and values how to greet properly. For example: do you kiss someone on the hand or cheek, or should you give a handshake? And is there a difference between greeting of men and women? Because it’s important to make a good first impression1, we will tell you about the possible differences that exist when it comes to greeting. Verbal communication refers to the use of sounds and language to relay a message. It serves as a vehicle for expressing desires, ideas and concepts and is vital to the processes of learning and teaching. In combination with nonverbal forms of communication, verbal communication acts as the primary tool for expression between two or more people1. In our case of multicultural competency, it’s important to highlight a few aspects of verbal communication that are important to keep in mind: direct versus indirect communication, tone of voice and rules of politeness. First, as an introduction, read ‘The psychology of verbal communication’2to have a introduction about verbal communication and to understand that any communicative exchange is implicitly a joint or collective activity in which meaning emerges from the participants’ collaborative efforts. The listener has to encode the meaning in the spoken words. 1A. Direct versus indirect communication. Do you talk loud, soft, fast, slow, high, deep? It all influences the way your message will be understood. Interpersonal communication not only involves the explicit meaning of words, the information or message conveyed, but also refers to implicit messages, whether intentional or not, which are expressed through non-verbal behaviours. Non-verbal communications include facial expressions, the tone and pitch of the voice, gestures displayed through body language (kinesics) and the physical distance between the communicators (proxemics). These non-verbal signals can give clues and additional information and meaning over and above spoken (verbal) communication. Many popular books on non-verbal communication present the topic as if it were a language that can be learned, the implication being that if the meaning of every nod, eye movement, and gesture were known, the real feelings and intentions of a person would be understood. Watch video American Hand Gestures in Different Cultures. Watch the video Greetings in different cultures. Read ‘Different Communication Rules between the English and Chinese Greetings’. Communication rules are both culturally and contextually bound to achieve effective and efficient communication. Pay attention to the differences of polite greeting between Chinese and English speakers. How do you normally greet someone you meet for the first time? Is there a difference between men, women, young or old, power distance? Which differences and similarities do you see between the styles in the article compared with your own style of greeting? Watch the video Cultural Dimensions about the differences between direct and indirect speaking. What would be your style, direct or indirect communication? 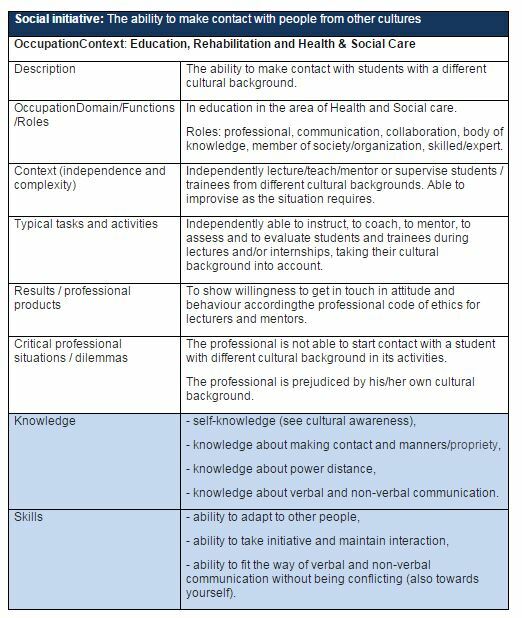 What is the communication style of most of your students? Do problems occur and if so, how to solve it? Read and follow the instructions from wikiHow and Corporate Coach Group to improve your tone of voice. What did you learn from the articles, what can you improve? Read this online article7and a second one8 about the types of non-verbal communication. Now make a self-analysis of the extent to which you are aware of your own non verbal communication on all these aspects. How is your body language influencing others? Ask two colleagues and two (foreign) students/trainees how they think about your non-verbal communication? Does it differ from your own perspective? Describe your findings and possible advices how to improve your non-verbal communication and discuss with colleagues. Read chapter one (page 9-18) of the book ‘Body Language’9 by A. Pease. Follow his tricks to learn body language on page 18 and reflect it with your peers. Watch the video Cultural Dimensions: low versus high power distance and open the country comparison2 section on Hofstede’s website to see the score of power distance in your country. Compare your country score on power distance and masculinity with one of the countries where the international students come from. Is there a big difference? What would you do to overcome these differences? Read chapter 14 (page 112-114) of the book ‘Body Language’3 by A. Pease to get more aware of how body language can influence your power position. What are the signs your body shows when it comes to power position?